Z3 Technology is an industry-leading, USA-based manufacturer of video encoding and IP camera systems. We are headquartered in Lincoln, Nebraska with engineering offices in Chicago, Illinois. From our subsidiary office in Japan to our team of video professionals, we know the needs of the global video community and serve customers in applications worldwide. Choose to output highly efficient H.265/HEVC compressed video or industry standard H.264 video. Now 4K resolutions don’t have to take 4x the bandwidth of HD. Streaming with high efficient H.265/HEVC encoding reduces the bandwidth requirements for HD and 4K video. Send Sony VISCA™ commands from any networked computer. An easy to use web-based interface allows for remote configuration of video output over IP. The flexibility of configuration is there. The choice is yours. Simultaneously stream your video in multiple resolutions from the same IP camera. Both the Z3Cam-4K and Z3Cam-HD allow video to be output in up to three streams. Each stream can be independently configured to a unique resolution, bitrate, output format or compression codec. Want to record your video? Streams can also be sent to a USB storage device. This feature is extremely important in security settings where bandwidth and storage space are limited, but the highest quality video is required. The Z3Cam-4K can stream the 2160p 4K video to be encoded via H.265/HEVC at 30 frames per second to a USB storage device while also streaming a 720p stream to be encoded at 30 (or lower) frames per second for viewing on a monitor. This is just one example of the flexibility of the Z3Cam-4K. The innovative Z3Cam Camera Solutions resolve the high network bandwidth utilization and infrastructure expense required by uncompressed or HDBaseT 4K or HD camera systems. It has multiple options for your IP video transmission including UDP, RTP,RTSP and RTMP. The Z3Cam-4K can output both H.265/HEVC and H.264 video over IP in 4K and HD resolutions while the Z3Cam-HD can output multiple HD resolutions. Wide content distribution and live event streaming is made possible through outputting H.264 video in RTMP. This standard format is accepted by a variety of Content Delivery Networks, such as the Wowza Streaming Engine™, as well as social media platforms, including YouTube live and Facebook live. Not only do these cameras allow high efficient H.265/HEVC streaming to be sent anywhere on the globe, they can also be controlled over any distance. The Power over Ethernet (PoE) option provides added flexibility in installation and use without the need for proximity to a wall outlet. High quality video streaming, small enough to fit in the palm of your hand. The compact design allows the Z3Cam-4K and Z3Cam-HD to go wherever you need it to. Both camera solutions feature a Gigabit Ethernet connection that allow users to stream video directly from the camera, update all output settings, and send remote camera control commands. Power your camera with the included 12V DC power supply or utilize Power over Ethernet (PoE). Additional interfaces include microphone input, composite output and HDMI output (Z3Cam-HD only). A USB 2.0 port allows for recording to storage devices. An RS-232 serial connection allows for advanced technical configuration and control. Access the Z3Cam-4K from any networked computer. Z3 Technology’s easy-to-use web-based interface allows for quick configuration and in-the-field setting updates. Create and save custom configuration options for future use. Create an optional password to prevent unauthorized access. Sony VISCA™ commands can be used for remote camera control, including zoom, focus and aperture. ONVIF® Profile S adds additional remote camera control options and easy integration into existing infrastructures. 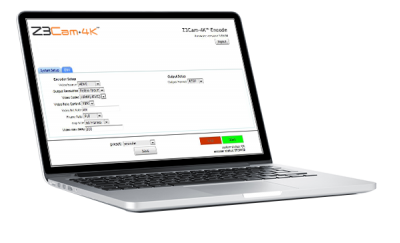 When in H.264 mode, the Z3Cam-4K’s encoded video stream is compatible with the ZEUS® HE4K-01 video decoder, also available from Z3 Technology. Contact our sales team for more information. 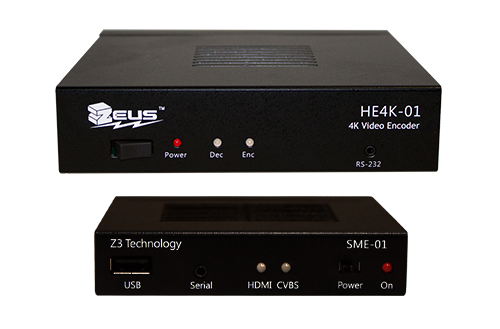 Any ZEUS® video decoder, also available from Z3 Technology, is the ideal solution for the Z3Cam-HD when encoding in H.264 mode.